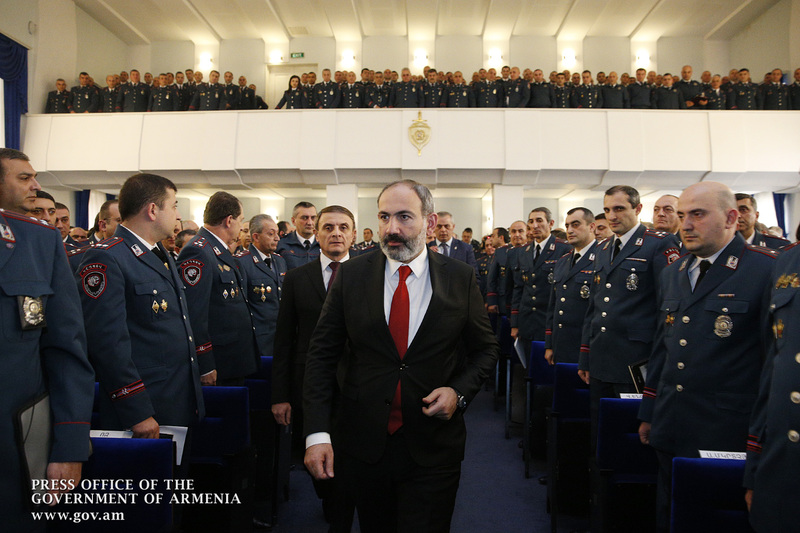 Prime Minister Nikol Pashinyan today participated in an expanded meeting of the Police Board, during which the results of the work of the Armenian police service and operational activities of the territorial bodies in 2018 were summed up. 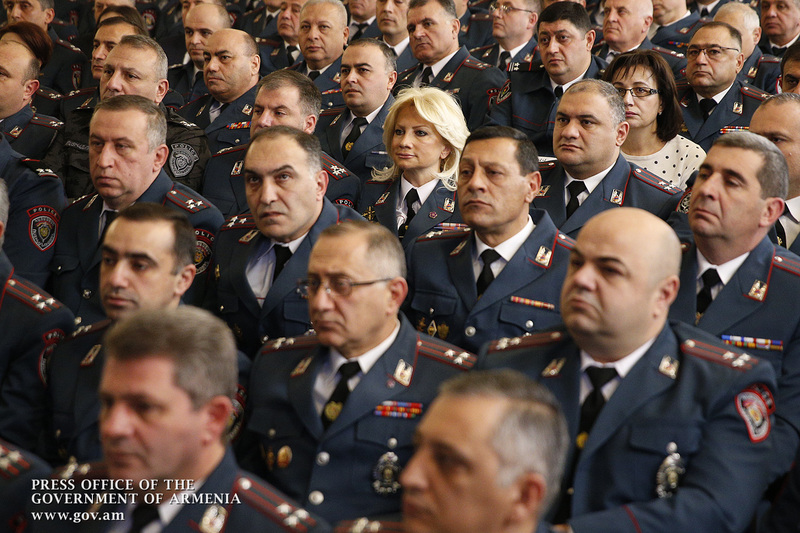 Chief of Police Valery Osipyan first presented the work on ensuring public order and security, carried out in 2018. According to him, in 2018 there was a tense agenda related to domestic political events, but the police as a whole fulfilled the tasks assigned to it thanks to the measures taken within the framework of the powers provided by law, the overall operational situation was under control. During the political events in April-May 2018, almost all police units were involved in maintaining public order and public security. In addition, together with other authorities, police officers were also involved in organizing and conducting mass events of national and international importance. 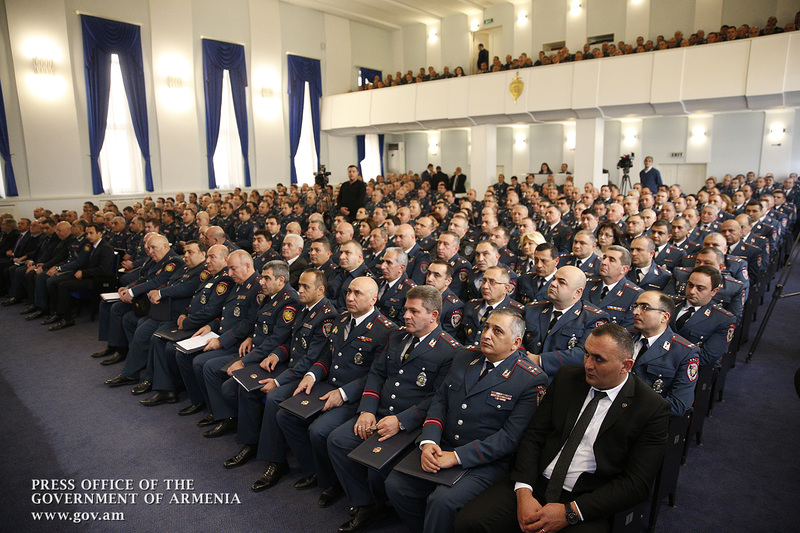 Since August 2018, police officers attended their combat duty to protect the state border of the Republic of Armenia. 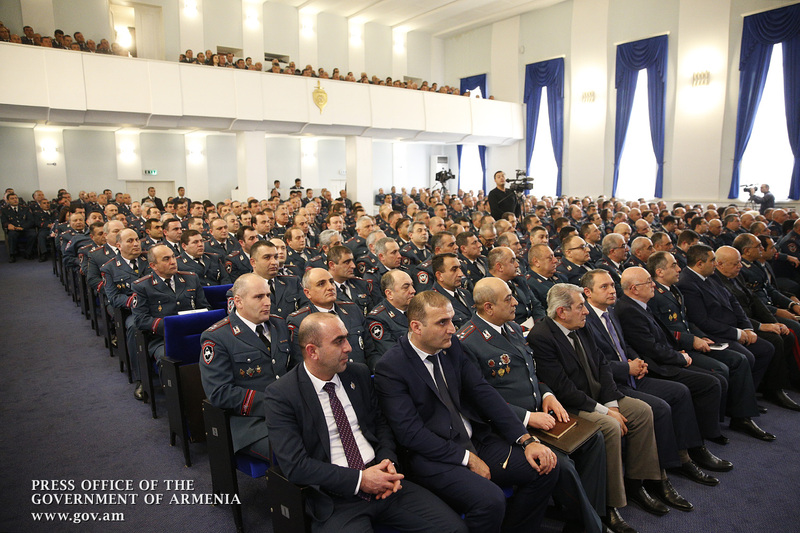 The Head of the Armenian police reported on the current operational situation in the republic, the main trends in the dynamics of crime, the state of disclosure of crimes and the effectiveness of the work, introduced for these purposes, new mechanisms, as well as the steps taken by the police to comply with the law. Valery Osipyan noted that the police, taking into account the problems existing in the dynamics of crime, are initiating the development of a comprehensive program aimed at improving the scale of disclosures of thefts, including robberies, prevention and disclosure of crimes. All departments will be involved in program discussions. The program will be submitted to the government after its finalization. 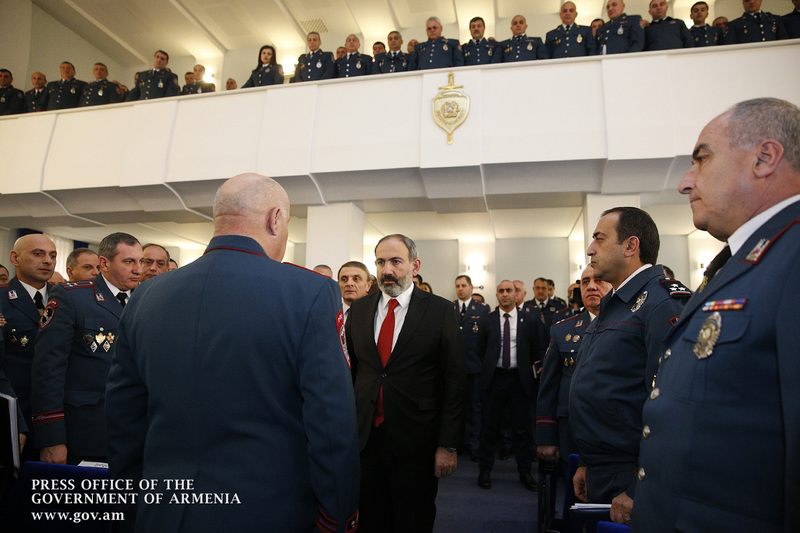 Prime Minister Pashinyan presented his comments on the work of the police in recent months. “In general, I can say that the police are fulfilling the tasks assigned to them, and we can record some of the results that have been achieved, including with the important involvement of the police. First of all, we are talking about the exceptional quality of elections and electoral processes in Armenia. I must admit that the police really played a very important role in this regard, in particular, in preventing possible mechanisms for bribing voters. We do not know whether the problem has been solved 100% or not, but the fact that we managed to eliminate the distortion of the will of citizens through electoral bribes during elections and electoral processes as a systemic problem is a fact, and the police play a big role in this matter. Secondly, the Police have assisted the Armed Forces in protecting the state border. I really consider this a revolutionary change and I want to once again express special thanks to the police forces, those officers who took this important responsibility to defend the borders of the motherland. I think that there has been a huge shift in relations between the police and the public, and the attitude of people as a result of these processes can be assessed as positive,” the Head of Government noted. 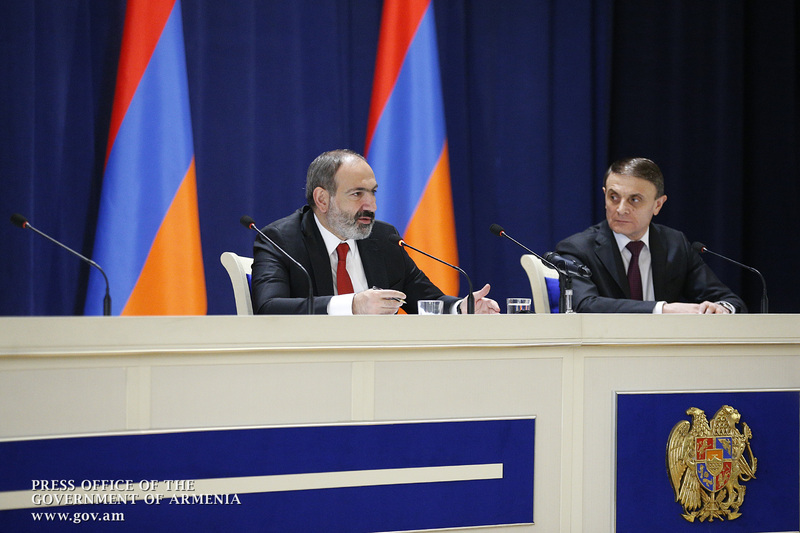 Speaking about systemic problems, Nikol Pashinyan noted that the political changes in Armenia had a shock impact on the police, and in this new situation - in the new Armenia - the role, functions and the rules of the police need to be clarified. 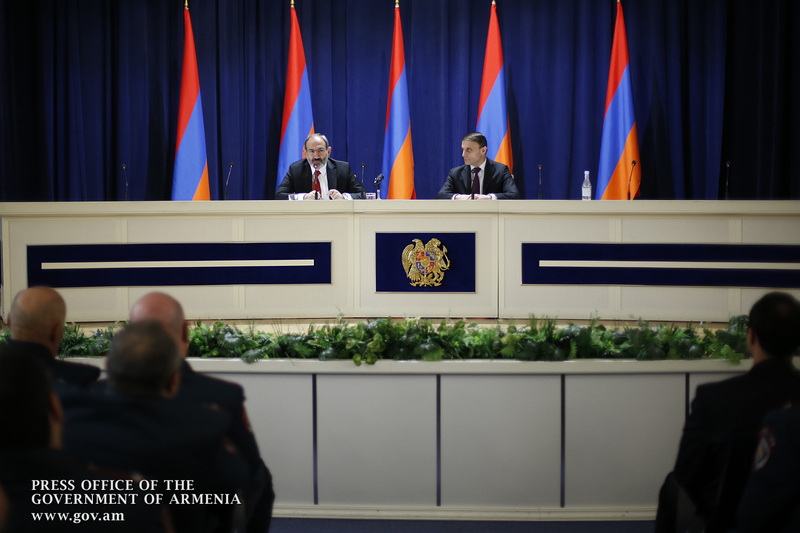 “I would like to emphasize two facets: the police of the Republic of Armenia cannot be a body that uses hard power against its citizens; on the other hand, the police cannot monitor the rights of citizens as an observer. There are no clear formulas here, but as a result of public discussions, we must come to a situation where the police are the guarantor of the rule of law, and there should not be any elements of political bias in this. It is very important to create certain guarantees for the stability of the law enforcement system,” the Prime Minister said. 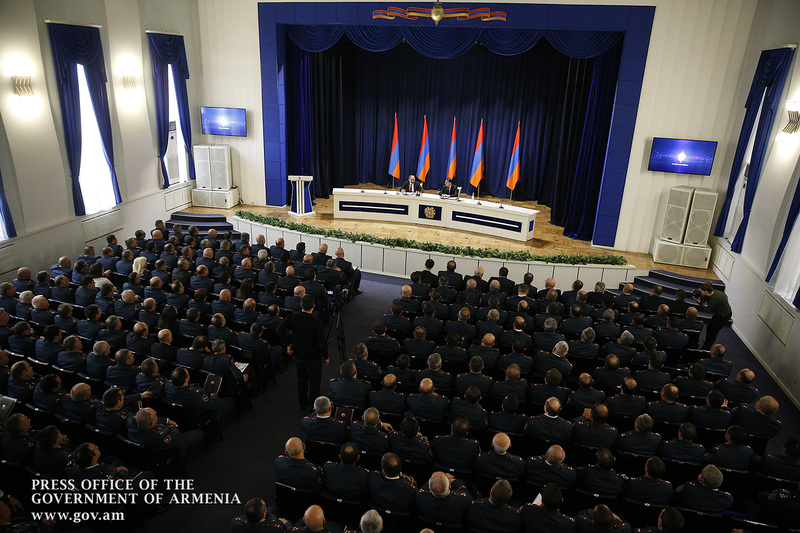 In this context, the Head of Government stressed the importance of police status. The Premier also highlighted the changes initiated this year in the police salary system. “In public, expert circles, social networks there may be different views and opinions on this issue, but I think that this is a clear and correct way, because if we want long-term results in the fight against crime and corruption, then we must take the path of increasing the salaries of police officers. At the same time, ordinary employees, who, in fact, are at the forefront of the fight against crime, must first feel this growth. I hope the changes that we have begun to implement in this direction will yield positive results,” the Prime Minister said, stressing the importance of structural reforms that will increase the efficiency of the police. 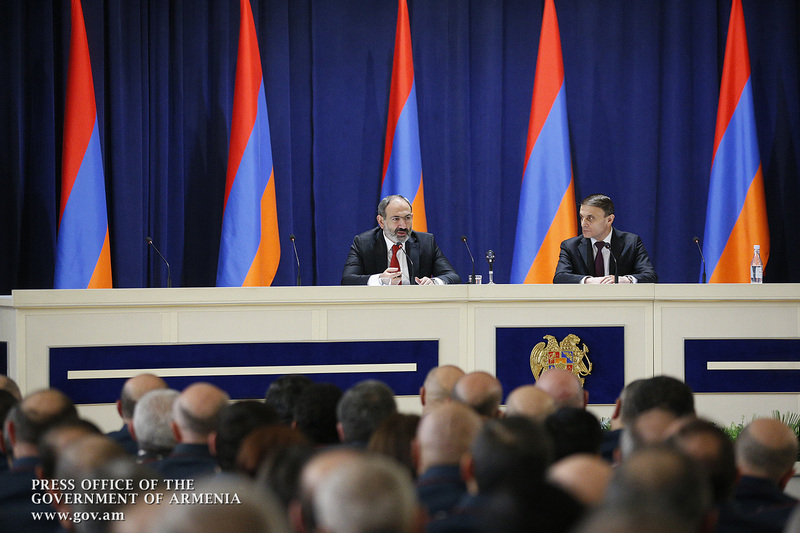 Nikol Pashinyan stressed that increasing the efficiency of the public administration system is the cornerstone of the country's further development. The Head of State stressed that the main priority is to ensure external and internal security. “At the same time, speaking of internal security, we never meant and will not mean restrictions on the rights and freedoms of citizens, restrictions on the activities of the opposition, and so on. 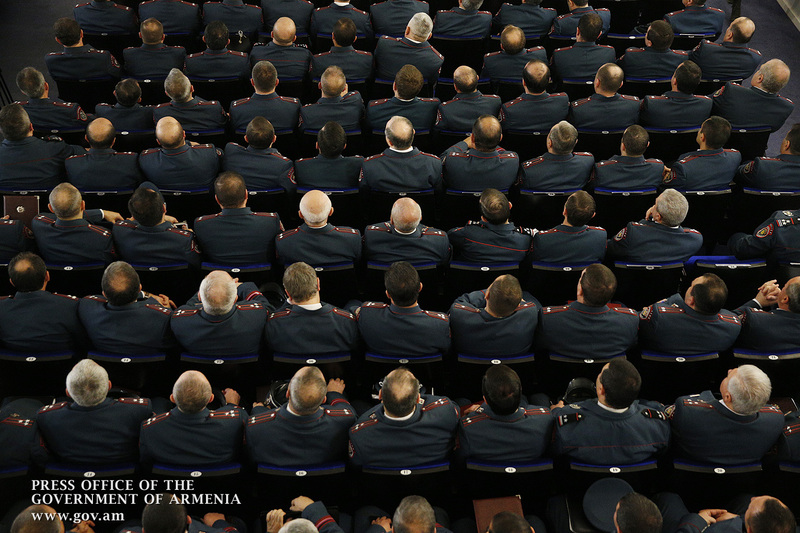 Speaking of security, we mean the rule of law, and I think that the last 9 months have shown that our government is not only not inclined to involve the armed forces, police and other law enforcement bodies of Armenia in political processes and make them part of political events, but, on the contrary, we managed to ensure that this did not happen, and this is the most important achievement. 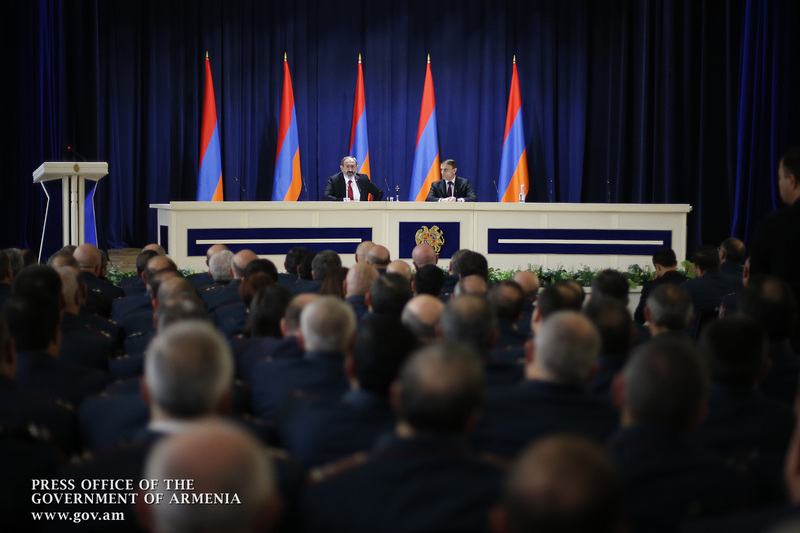 In general, the task assigned to the police can be formulated as follows: the police must be strong, must act in accordance with the law, and citizens of the Republic of Armenia must be sure that the only purpose of the police service is to ensure their rights, security and freedoms. I attach importance to the fact that the police is strong, but I want to emphasize that this does not mean that it must be cruel, commit illegality and act in conditions of permissiveness. Being strong means being respectful of citizens, strict with the law and having a balanced attitude to the rights of citizens. 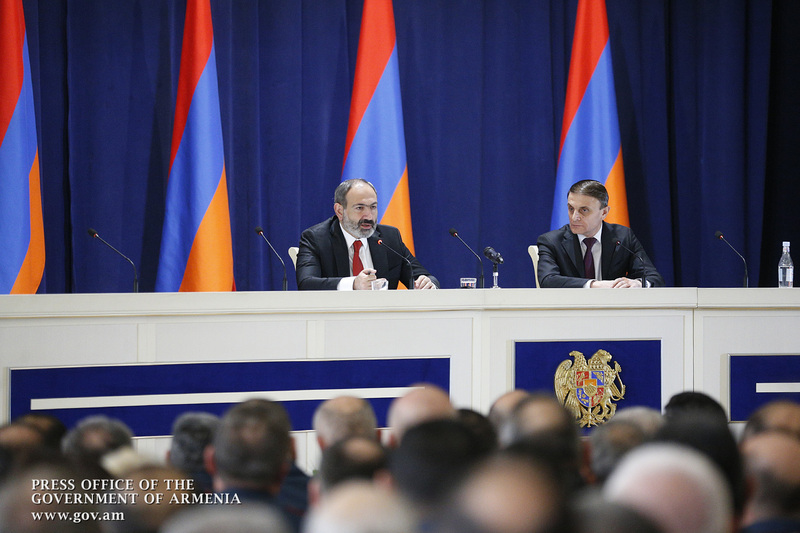 All citizens of the Republic of Armenia have a government formed as a result of internationally held free, fair, democratic and legal elections, and the number one duty of this government is to ensure normal life for citizens in the country and ensure the rights and freedoms of people. People can freely express their opinions, in Armenia there can be no talk about restricting freedom of assembly, processions or demonstrations, but this does not mean that anyone who has problems with someone should close interstate roads and customs points. That is, people close roads to protect their right to smuggling, they say that they are not allowed to engage in smuggling. 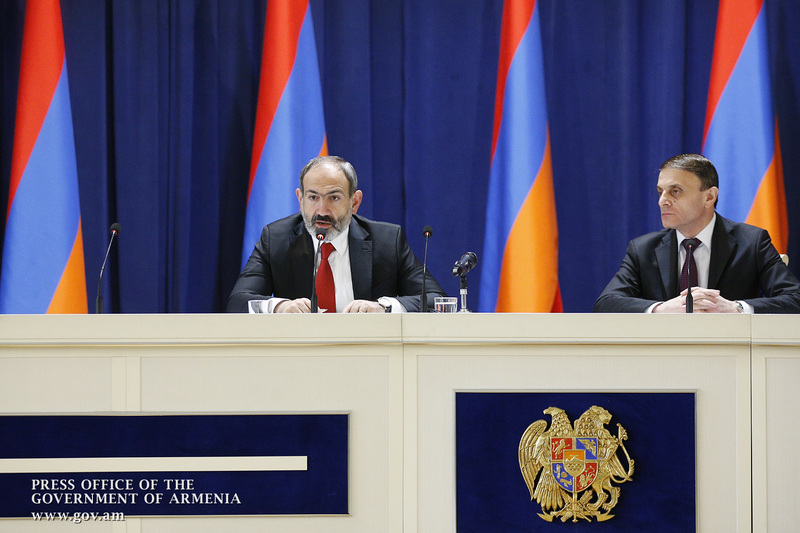 Of course, we do not allow and will not allow this,” Prime Minister Pashinyan said. In this context, the Head of Government touched upon the stereotypes about democratic governance: “Many believe that democracy means permissiveness. Democracy is the system with the strictest legal order, because one of its key conditions is the rule of law. Where there is no rule of law, there can be no democracy; where there is no rule of law, we will quickly face anarchy under the guise of democracy. 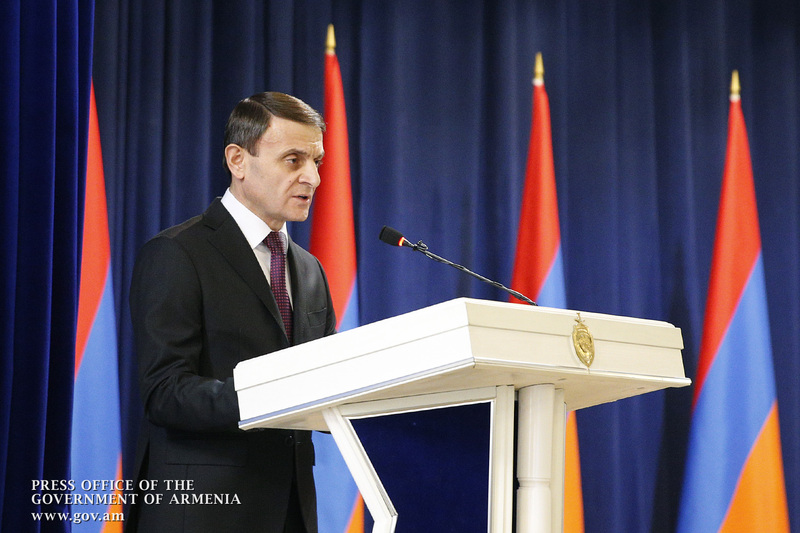 We should send a clear message that relations between the citizens of Armenia and the police should be at a high level, we should have a growing dynamic of mutual trust, but, on the other hand, no one should think that democracy is a weakness: it is not and cannot be a weakness, especially in today’s Armenia.